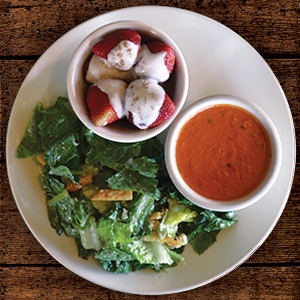 Choose any three: Cup of Soupe, Caesar Salade, Strawberry & Bacon Spinach Salade, Cranberry & Pecan Wild Field Salade, Chicken Salade, Tomato Basil Pesto Pasta Salade, Strawberries Romanoff, Fruit Salade. 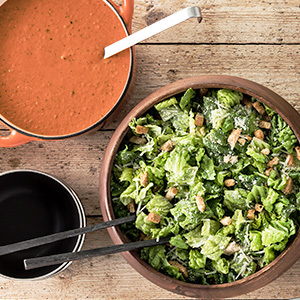 Choice of one of each soupe and salade. Served with freshly-baked sea salt baguettes. Signature Homemade Soupe: tomato basil, french onion or country potato. Our signature homemade soupes for a group of 10. 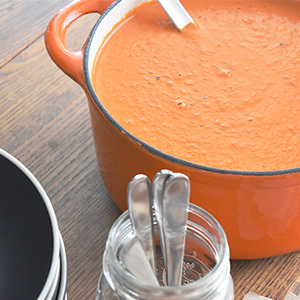 Choose from our signature homemade soupes, tomato basil, french onion or country potato. Served with freshly-baked sea salt baguettes.